The following is a slightly shortened and modified translation of “A working method for the preparation of sermons on OT narrative material”, which was printed as attachment to Dr. C. Trimp’s booklet De Preek (The Sermon). His method consists of four phases, which he calls analysis, synthesis, administration, and evaluation. Analysis refers to the first phase of the sermon making process: exegesis. The usual exegetical steps are to be followed (establishing the meaning of words and sentences, etc.). Taking the context into account, the specific character of the passage needs to be determined. In order to do that, the exegete needs to look back, look around, and look ahead. Looking ahead means studying the message of the Bible book. What was it that the Lord wants to achieve here? What are people doing before the face of God? Example: The Bible often speaks about God’s intentions and the chosen people’s disobedience, e.g. Deut. 32, Joshua 24, 2 Kings 17:7ff, Ps. 78, 105, 106. After the first round of exegesis the preacher should analyze the text in a more synthetic way, reflecting on theological themes that are revealed in the text. The preacher should reflect on two questions: 1. What does the text reveal about God? 2. What does the text reveal about man in the covenant with God? What does the text reveal about God? The Trinitarian approach is useful here. What does the text reveal about God’s work of creation and providence (the work of the Father)? What does the text reveal about God’s work of salvation (the work of the Son)? What does the text reveal about the God’s work of sanctification, his gifts of repentance and faith and perseverance to his people (the work of the Spirit)? H.J. Schilder’s treatment of the book Ruth is a good illustration of this approach. What does the text reveal about man in the covenant? Is man faithful? Is he weak? Is he able to resist temptation? Does he trust his own power or God’s power? Does he set his eyes on prosperity here and now, or does he look forward to the future promised by the Lord? 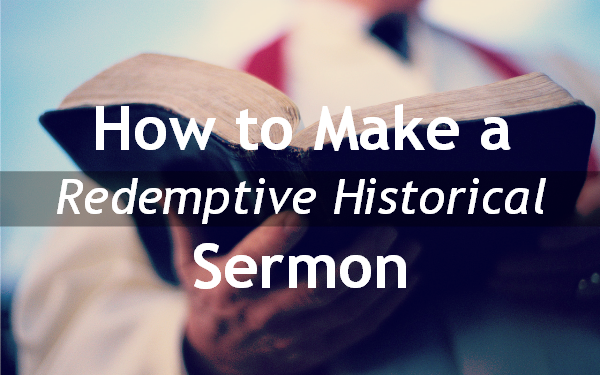 Hebrews 11 gives us many examples of this approach of looking at history. These questions will help the preacher to gain an understanding of the redemptive-historical aspects of the text passage. In order to ‘fine tune’ these aspects one could use the four questions which prof. B. Holwerda formulated: the ‘already’, the ‘not yet’, the ‘no more’, and the ‘still’. The ‘already’: Even in the old covenant there was rich covenantal fellowship between God and his people through the mediating work of the Son of God and through the work of the Holy Spirit. Those who lived in the old dispensation did not by implication have an impoverished form of fellowship with God. Noah had a good understanding of God’s work, more than e.g. Zedekiah (compare Gen. 6-9 and 2 Kings 24:19) Abraham’s joy at the birth of Isaac was joy because of Christ (see John 8:56). The ‘not yet’: Moses was able to see much of God’s glory (Ex. 33:19) but the Lord’s disciples were allowed to see more (John 1:14). See also Luke 10:23, 24. In the old covenant there was mourning when the high priest died (Num. 20:29). This called for the joy of faith because of the eternal priesthood of Christ (Hebr. 7). The ‘no more’: Israel had to distinguish between clean and unclean animals, so that in the practice of daily life they would learn what God intentions with his people are, and how God’s people are called to holiness (Deut. 14:3-21). This form of service has been abolished in the new dispensation (Acts 10:9ff; Gal. 2:11ff; Col. 2:16ff; Hebr. 8-10). Yet, the truth and substance remains (art. 25 B.C. ): our life shall be sanctified through the Spirit of Christ. The ‘still’ of the NT: The ‘fear of the Lord’ is a covenantal demand that has become even stronger with God’s revelation in Christ and the Spirit (see Hebr. 10:26-31). The joy of OT believers experienced because of the exodus from Egypt (Ex. 15) is experienced even stronger in the NT congregation when it celebrates the Lord’s Supper. The intention of these questions is not that a preacher should explicitly deal with them in the sermon. Rather, he should use them as ways to approach the full meaning of the text. During this phase we attempt to establish the actual authority of the text passage for the actual congregation to whom we intend to preach. The task of ‘bridging the historical gap’ is now before us. What is being accomplished during this phase will determine the content of the sermon. Four aspects may be distinguished. Observe the continuity between then and now. There may be continuity on two levels. First, there is continuity with respect to God’s self-revelation. He still is the God He was then. When we see how He dealt with believers like Noah, Abraham, Isaac, Jacob etc. we learn to know the God that He still is for us today. The God of the fathers is our God. Second, there is continuity with respect to human behaviour. People may wear different clothes today, but their hearts have not changed. In what is revealed about the joys and fears and sins of OT believers, we hear our own story. Observe the discontinuity between then and now. The congregation of today belongs to the same covenant as the people of Israel but it is a new dispensation, so there are important differences as well. See what was mentioned in the previous paragraph under the ‘not yet’ and the ‘not anymore’. The situation of the congregation may lead to emphasizing specific elements of the texts. A text may have various ‘usus’, as we have seen in the previous point. Therefore it is legitimate that the situation of the congregation may influence the preacher’s decision on what elements he chooses to highlight. The final phase of sermon preparation is the evaluation of the result. After the grammatical meaning, the Scriptural message and the subordinated elements have been determined and formulated with a view to the congregation, we should ask the question: Do the various elements strengthen or contradict each other? Do they form a harmonious unity? Do the ‘basso continuo’, the ‘cantus firmus,’ the harmonization and the counterpoint, all serve to bring out the theme? Do they together produce a well composed and well structured end product? At this point simplicity and evidentiality will prove to be important characteristics of good preaching. H.J. Schilder, Richteren en Ruth: Een vacature vervuld, Kampen: Kok, 1982.